Leaving Guadlest and the hairy drive back down the mountain, we were ready for a couple of days at the beach. We were headed towards Campello Beach Camperstop at Muchavista playa north of Alicante (38.394441, -0.4120937). When we arrived however there was a “completo” sign on the gate – they were full. Part of me was glad we couldn’t get in as the vans were all parked so close together – not a recipe for a relaxing couple of days in my book. The parking laybys at the side of the road outside the campsite were wide and long enough for us to park along the road for a couple of nights – not very wild but wild enough. To be honest there’s not much to see around the area. There is a small commercial centre about 1km away from the site with a huge Mercadona and a couple of bars and shops but the beach front, although its very clean and quiet is almost deserted. There are little or no shops or cafes in the area and its more of an urbanisation of summer homes than a tourist area. The beach is 7km of white sand stretching down towards Alicante but the train that connects Benidorm to Alicante runs along the side of the beach here and you have to cross the railway tracks to reach the promenade. We stayed a couple of nights and were able to dump our cassette at the Campello service area inside the camperstop for €3, which was very reasonable. We could have dumped our grey tank and filled with water for a total of €5 but we only needed the cassette emptied and so we were off again. 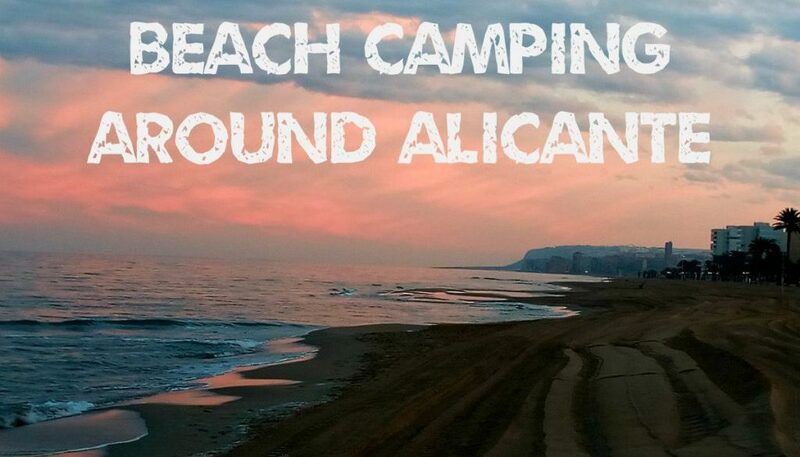 Alan had some co-ordinates for a couple of beachside free camping sites with no services. So we headed off to see what we could find. What we did find were lots of small sandy tracks, and thousands of poly-tunnels housing vegetables and fruit. Eventually we passed Alicante airport and came across a large open area at Platya Altet with some hard standing for parking right beside the sea (38.289187, -0.5210642). This’ll do us we thought. Lovely spot, no services but a short walk into the new urbanisation, Urbanova. There were a few bars, cafés and restaurants open along the length of the promenade. The sight of other people eating makes Alan want to eat too, so we went into a bar/cafe called Moments right on the sea-front. Alan had a bowl of the biggest mussels I’ve seen yet, grilled on the plancha and drizzled in sweet mustard – he said they were amazing. I’ll take his word for it – I’m not a huge fan of shellfish. This spot is not far from Alicante airport and the flight path. When we arrived the planes were taking off over the sea, but by the next day the winds must have shifted and they were taking off inland – with the inbound flights arriving over the sea and looking like they were about to crash into the apartments as they descended. The noise from the aircraft didn’t bother us and before long we hardly even noticed it. We later discovered that there had been about 50 vans parked there until a couple of nights before when the Police came and cleared the site. I wondered why the other parking area close by was still full but it appears that our area belongs to Santa Pola council and the other one belongs to Elche council – so two different sets of rules enforced by two different Policia Local from different council areas. There was a tiny little church on the corner of the road, Ermita de Nuestra Señora del Rosario. It is the smallest place of worship I have ever seen. yet it was still decorated inside with fresh flowers.